A fenced-in 110 000 litre swimming pool with a constant depth of 1.4m, is ideal for kids and grown-ups alike, for playing games and swimming. For the children to call and feed the variety of friendly and docile farm animals, is always a big treat. The interaction with these animals is far more meaningful to children than the more abstract contact via encyclopedias or TV programs. The farm tractor which is sometimes used for scenic trips and a little driving lesson for the kids (With the consent of their parents) is often the highlight of the holiday and guarantees unforgettable photographs. Most of the 600 hectares is suitable for walks, with lovely trails in the hills or through the vineyards and orchards. In springtime the veld is a paradise of succulents and wild flowers. Right through the year there are a variety of interesting plants, shrubs and grasses. All around, in the reeds, open fields, in the hills and at the dams, are numerous and interesting birds - more than 86 different species have been identified by our guests. A feast for both the beginner as well as the serious bird watcher. A birdlist, photos of the birds and route maps are available. Numerous interesting insects go their way, for kids to watch and study... let them find a "toktokkie" and talk to him and watch its antics! Other small veld animals also have their habitat at Rietvlei. Baboons frequently assist in harvesting our fruit and grapes! The little "Bakoor" jackal and different antelope make their appearance to come and feed. Even the odd snake joins the party... and we all live in harmony with nature! Lots of room for energetic children and their bikes. 3 Challenging mountain bike routes are on the maps, with different stages of difficulty. The clear unpolluted sky ensures our star gazers a more magnificent view of the galaxy (and frequently passing satellites) than many other areas in the country. Only 2km from the cottages are plenty of Black Bass and Talapia in Rietvlei's big dam. The old school building on Rietvlei has just the right atmosphere for a farm wedding with the reception under the trees or in a big tent. For those who are interested, co-ordination and catering can be arranged. 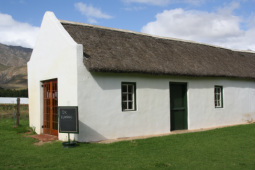 The Waenhuis is ideal for bigger groups who have a meeting/conference or want to have a function for up to 30 people. Wander through the garden and find “animal name” plants indicated on stone. Meet our artist in person and see his art all over the farm!! 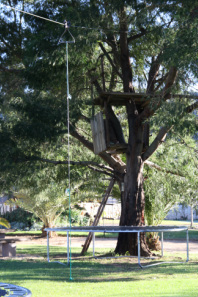 Come and try out our real farm foofy slide!!! Kids Parties/ Baby Showers/ Kitchen Tea's or any Party!! The Waenhuis is the ideal venue for any type of party. We can plan a party that fits into your budget – allowing you to organise as much, or little of your party as you would like! The venue can take up to 30 guests. Click here to see what we can offer you!